This might not be one of the first Ancient Egyptian-themed free slots you have met nor will it be the last. As a hot topic in the world of free slot games, Cleopatra has been featured in several slots by several game developers. Therefore, although Cleopatra’s Gold does not feature a unique theme, the game still holds its own spot in the Egyptian slots’ realm. 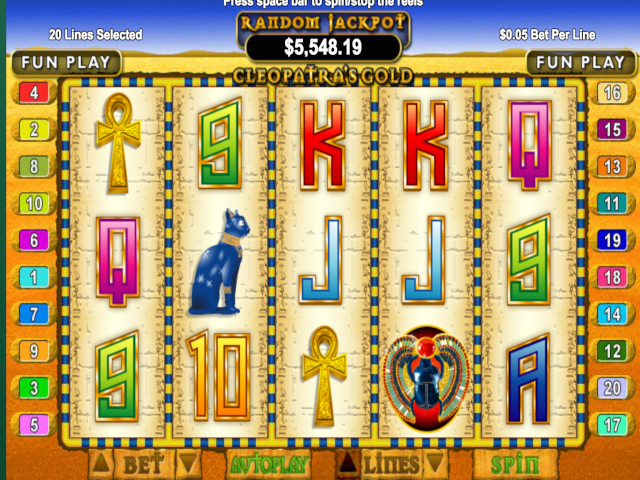 Realtime Gaming tapped into Cleopatra because she is a successful character on the reels and the winning component of the free slot development. What is great about Cleopatra’s Gold free slot game is that it is compatible with a wide range of mobile devices. Cleopatra’s Gold slot has a traditional touch that appeals to casual slot game players that are fond of simple slot play and unsophisticated features and graphics, unlike the more advanced features and graphics that are being executed in the most contemporary 3D online slot games. This 5-reeler covers 20 paylines and is spiced with features like free spins and wild multipliers. The symbols depict Cleopatra’s era and include the real Cleopatra, the Egyptian jewels, the pyramids, the Eye of Horus, and hieroglyphic symbols that represent the values of standard playing cards. Cleopatra represents the Wild symbol, which can replace all other symbols on the reels except the Pyramid to finish winning combinations. All the wins you incur due to the wild wins are doubled. Cleopatra’s Gold slot game features the RTG progressive jackpots that can be randomly activated after any spin. The prevailing jackpot value is still increasing and you can see from the top of the reels. The advantage of random jackpots is that they guarantee that casino cheaters cannot rig the game to win the progressive jackpot. If 3 or more pyramids appear on the reels, you will earn 15 free spins and every win incurred during the free spins are tripled. If you get at least 3 scatter symbols on the reels during the free spins, you will reactivate 15 extra free spins. In the Cleopatra’s Gold free slot game, bets per line begin at only 0.02 and increase up to 5.00 per line. Bettors will incur 100.00 in a maximum bet on all the 20 paylines. This makes Cleopatra’s Gold a versatile online slot game fit for any level of bankroll – it appeals to both high rollers and micro-limit slot players. Cleopatra’s Gold slot provides you with minute but recurrent wins. Since the gameplay and the graphics are purely basic, slot players that like low-frill slot games might find this game to be relaxing.